Various social factors, such as education, income, work, living environment, housing, lifestyle and access to services, determine an individual’s state of health. These interact in varying combinations throughout the life course. Inequitable distribution of these factors, or health determinants, among groups generates considerable health differences among people within a community or a country, or between countries. The gaps, or unequal distribution of health status, linked to these determinants within a population are referred to as social inequalities in health (SIH). These inequalities are not inevitable and could be reduced, according to the World Health Organization (WHO). The problem of social inequalities in health is vast and complex: unequal power dynamics and exclusion, as well as certain policies and social norms and practices, generate social and health disparities. Data on the scope of SIH in Québec speak for themselves. The differences between socioeconomic groups, in terms of life expectancy and premature mortality, are marked. For example, in 2006, the gap in life expectancy between the most disadvantaged and most advantaged segments of the population was 8.1 years for men and 3.9 years for women. Similarly, in the most disadvantaged segment of the population, 93% more individuals did not consider their health to be good, 88% more were daily smokers, 54% more were dissatisfied with their social life and 28% more were obese, as compared with the most advantaged segment. Some population groups, such as Aboriginal peoples, were shown, in certain cases, to be affected to an alarming degree by social inequalities in health. Government intervention to reduce SIH is neither simple nor unambiguous, and necessarily involves an array of interventions. Governments have developed different approaches to reducing SIH. Some countries, for example, have adopted a systematic and comprehensive government policy to reduce SIH, while other countries have instead developed a national public health policy that explicitly targets the reduction of SIH, or addresses the social determinants of health upstream. Implemented in conjunction with these global approaches, a number of sectoral or intersectoral interventions focused on health determinants can contribute significantly to combating SIH. There is no scientific consensus regarding how to effectively take action to reduce SIH, although some authors recommend giving priority to interventions that promote more egalitarian access to resources, such as those targeting income, employment, and access to education and services. However, the need to take SIH into account when considering government intervention, at the very least to avoid worsening the situation, is acknowledged by experts. In addition, this review demonstrates that to reduce SIH, social policies must be strengthened both at the level of the general population (universal interventions) and at that of disadvantaged populations (targeted interventions), without stigmatizing the latter. Consequently, proportionately targeted interventions, or actions aimed at the general population, but implemented in conjunction with interventions modulated according to the social gradient of health, should be preferred and strengthened. The review of foreign experiences also helps to identify the conditions most likely to produce promising results, which include the mobilization of different actors around shared priorities for action, citizen participation in interventions, high quality interventions and the integration of services to enhance their accessibility. Québec cannot adopt, at the provincial level, a policy on the same scale as those of several of the countries discussed in this document; it may, however, draw inspiration from them, while taking into account the federal context within which it operates. Québec does not have a policy that specifically or globally targets the reduction of SIH. However, the Québec government has implemented large-scale interventions that address social and economic inequalities by targeting poverty or social exclusion, for example. Some avenues to be explored by the Québec government emerge from this study, including, in particular, the promotion of a shared vision for reducing SIH that mobilizes all government sectors, the strengthening of achievements tied to social protection, to the fight against poverty and to action addressing the determinants of health, the establishment of a monitoring system and the participation of citizens in decision making. 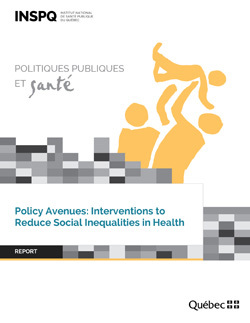 A synthesis is also available: Policy Avenues: Interventions to reduce social inequalities in health - Synthesis.